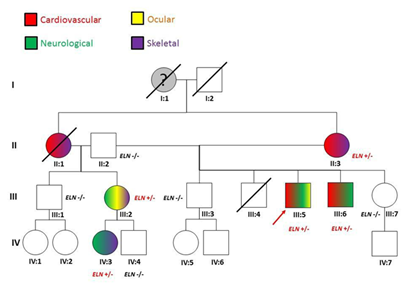 A heterozygous mutation of the elastin gene (ELN: p.val154met) fully co-segregates with classic marfan phenotype in a sardinian family: a possible novel disease-gene? Fibrillin 1 (FBN1), TGF-β-receptor 2 (TGFBR2) and Latent binding protein (LTBP) gene defects have been associated with Marfan syndrome (MFS) with classic phenotype. However, molecular testing in adults with overt MFS phenotype does not reach the 100% of genetic diagnosis. We then designed a targeted NGS panel by pooling 20 causative genes involved in the Extra Cellular Matrix (ECM) constitution and remodelling with the aim of increase the molecular yield when testing MFS patients. We then run molecular analysis on a PGM Io Torrent platform and confirmed the identified sequence variants by conventional Sanger Sequencing on MFS diagnosed according to the Ghent criteria. We identified a heterozygous missense mutation in the Elastin (ELN) gene (p.V154M) in a Sardinian family with classic MFS phenotype. The co-segregation analysis of the identified missense mutation proved to be pathogenic within the family. Our data, although on a single case/family, led us to conclude by proposing a novel association of the ELN gene mutations to contribution of the onset of MFS classic phenotype. Risk of spontaneous intestinal, uterine and arterial rupture as well as joint and cutaneous manifestations. MFS and other collagen-disorders (i.e. vascular Ehlers-Danlos syndrome or vEDS, Loeys-Diets syndrome(s) or LDS) share histopathologic features of medial degeneration, characterized by destructive matrix remodelling with elastin fragmentation, impaired proliferation of vascular smooth muscle cells, and proteoglycan deposition.1 Because the genes mutated in MFS and vEDS encode for extra cellular matrix (ECM) proteins (fibrillin-1 and type III procollagen, respectively) and other genetic conditions leading to aortopathy show causative mutations in small molecules involved in the ECM remodelling belonging to the TGF-b pathway (thoracic abdominal aortic aneurysm or TAA and abdominal aortic aneurysm or AAA), a plausible hypothesis is that altered ECM contents led to structural weakness in the aortic wall, thereby leading to progressive aneurysmal dilation (Figure 1). Although this assumption is too simplistic, genetic evidences supported this hypothesis with a plethora of additional mechanistic features (Figure 1)(Table 1). 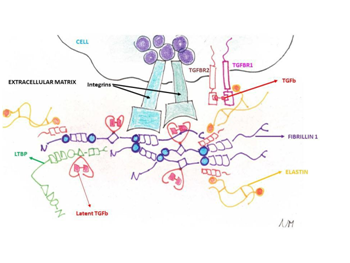 Figure 1 The ECM and the cellular surface components involved in the collagen disorders and their relationships. The chemokine Transforming Growth Factor-b (TGF-b) has a pivotal role being sandwiched in the fibrillin (FBN1 gene) and latent binding proteins (LTBP gene) and being the ligand of the Transforming Growth Factor-b Receptor 1 (TGFBR1 gene) and Transforming Growth Factor-b Receptor2 (TGFBR2 gene). Additionally, elastin fibres (ELN gene) are bound by S-S bridges to the fibrillin microfilaments. Figure 2 The proband’s (III:5) family pedigree. For each of the tested member, phenotypic (colour code) and genotypic information are given. The grand-mother (I:1) was reported died suddenly aged 55. No autpsy was done. II:1 died during in a car accident: she was reported presenting skeletal and cardiovascular signs (mitral valve prolapse and aortic dilation). Isolated familial pulmonary stenosis10 (MIM 185500) and cutis laxa11 (MIM 123700). The clinical problem of differential diagnosis between MFS and MASS syndrome (myopia, mitral valve prolapse, mild aortic dilatation, and skin and skeletal manifestations (MIM #157700))12 in these patients is particularly difficult. We excluded a MASS syndrome in our proband because the skeletal system was severely affected along with the cardiovascular system and his aunt (II:1) deceased for aortic root dissection at 40 years of age. Additionally, in our proband the major cardiovascular, skeletal and ocular signs led per se to the diagnosis of MFS. Therefore since no other mutations of the presently known genes were identified and because of the co-segregation within the family, we might support a novel association of the ELN gene to MFS (analogously to several other diseases that are allelic at the same locus): the major clinical message is that aortic aneurysms and dissections, valvular stenosis and skeletal features are the common marker of all known phenotypes associated to ELN gene defects. Available clinical and scientific data on this single family, however, are still nonsufficient to exclude the presence of deep intrinsic mutations, large genes re-arrangements in known genes as well as the presence of mutations in genes yet to be identified. Furthermore, additional studies on the involved extracellular matrix components by means of conventional histochemistry, immunohistochemistry and electron microscopy can shed lights on the intimal mechanisms by which ELN gene defects can underlie such phenotypes. The clinical characteristics of the proband and his family members are summarised in Table 2. All patients were referred to our outpatient’s clinic for Inherited Cardiovascular and they underwent multidisciplinary clinical and non-invasive instrumental study (cardiological, ophthalmological, orthopedic, radiological, and lumbo-sacral magnetic resonance imaging (MRI) for the detection of dural ectasia). The aortic root diameter was evaluated with 2D echocardiography by experienced echocardiographists. The diagnostic criteria for MFS were still based on Ghent nosology in adults.7 Patients received detailed information on the MFS and related diagnostic work-up, likelihood of mutation identification, methods of analysis of the genes and related sensitivity. Written informed consent was obtained from all probands or, in case of age<18 years, from their parents, as well as from all relatives who underwent clinical and genetic screening. DNA isolation: Genomic DNA was isolated from peripheral blood leukocytes by means of the semi-automated platform Maxwell 16 (Promega). Next generation sequencing: A custom panel was designed with the AmpliSeq chemistry (Thermofisher; design identification code IAAD#93109). The panel includes the complete coding regions (with exon/intron boundaries) of the following disease-genes: FBN1, TGFBR1, TGFBR2, TGFB2, TGFB3, MYH11, ACTA2, MYLK-AS1, MFAP5, PRKG1, SMAD2, SMAD4, COL1A1, COL1A2, COL5A1, COL5A2, COL3A1, COL5A3, LTBP and ELN for a total of 784 amplicons with a target gene coverage of 98.6%. The preparation of the amplification libraries was fully automated and run on an Ion Chef platform (Thermo fisher) and then the Ion 318 chips (version 2) were run on an Ion PGM (Thermo fisher). We then annotated rare (allele frequency<1%) damaging mutations included loss of function (i.e. nonsense, canonical splice site, and frameshift) and missense variants annotated as pathogenic or predicted to be damaging by computer algorithms and public databases (Anno Var, Sift, PolyPhen, Clin Var, HGMD, Variant Interpreter and Variant Caller). After mutations’ prioritisation by bio-informatics analysis, the candidate genes mutations were subsequently validated (see later). Sanger sequencing and co-segregation analysis: To validate and perform co-segregation analysis, we amplified the exon 23 of the ELN gene with the following intron-specific primers design by the program Primer Express (Thermo Fisher) under stringent conditions: ELN23F5’TCGACTGCACCATTTTACAAATGG-3’ -and ELN23R 5’-CCACACTCCTAGAGGTCATTCATCA-3’. The same primers were applied to the PCR products for the Sanger sequencing done with the Big Dyes chemistry version 3.1 on a ABI PRISM 3500 platform (Thermo Fisher) (Figure 3). Sequence analysis and alignments were done by means of SeqA (version 6.0) and Seq Scape (version 3.5) respectively (Figure 3B). 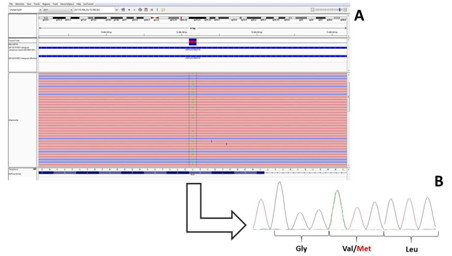 Figure 3 A) Next Generation Sequencing reads as from the IGV (integrative Genomic Viewer) software of the Exon 23 of the ELN gene (in the proband III:5) being G the wild type allele and A the mutate allele; B) Sanger Sequencing confirmation of the NGS data showing the double peak at the Val 154 amino acidic residue. This report was supported by the Regione Sardegna project “Epidemiologia e Genetica della morte improvvisa in Sardegna e sue correlazioni con le canalopatie”. Abraham PA, Perejda AJ, Carnes WH, et al. Marfan syndrome: demonstration of abnormal elastin in aorta. J Clin Invest. 1982;70(6):1245−1252. Aoyama T, Francke U, Gasner C, et al. Fibrillin abnormalities and prognosis in Marfan syndrome and related disorders. Am J Med Genet. 1995;58(2):169−176. Mizuguchi T, Collod-Beroud G, Akiyama T, et al. Heterozygous TGFBR2 mutations in Marfan syndrome. Nat Genet. 2004;36(8):855–860. Attias D, Stheneur C, Roy C, et al. Comparison of clinical presentations and outcomes between patients with TGFBR2 and FBN1 mutations in Marfan syndrome and related disorders. Circulation. 2009;120(25):2541−2549. Zilberberg L, Phoon CK, Robertson I, et al. Genetic analysis of the contribution of LTBP-3 to thoracic aneurysm in Marfan syndrome. Proc Natl Acad Sci U S A. 2015;112(45):14012−7. Robertson I, Jensen S, Handford P. TB domain proteins: evolutionary insights into the multifaceted roles of fibrillins and LTBPs. Biochemical J. 2011;433(2):263−276. Aalberts JJ, Thio CH, Schuurman AG, et al. Diagnostic yield in adults screened at the Marfan outpatient clinic using the 1996 and 2010 Ghent nosologies. Am J Med Genet. 2012;158A(5):982−988. De Paepe A, Devereux R, Dietz H, et al. Revised diagnostic criteria for the Marfan syndrome. Am J Med Genet. 1996;62(4):417–426. Duba HC, Doll A, Neyer M, et al. The elastin gene is disrupted in a family with a balanced translocation t(7;16)(q11.23;q13) associated with a variable expression of the Williams-Beuren syndrome. Europ J Hum Genet. 2002;10(6):351−361. Boeckel T, Dierks A, Vergopoulos A, et al. A new mutation in the elastin gene causing supravalvular aortic stenosis. Am J Cardiol. 1999;83(7):1141−1143. Beighton P. The dominant and recessive forms of cutis laxa. J Med Genet. 1972;9(2):216−221. Dietz HC, McIntosh I, Sakai LY, et al. Four novel FBN1 mutations: significance for mutant transcript level and EGF-like domain calcium binding in the pathogenesis of Marfan syndrome. Genomics. 1993;17(2):468–475. ©2018 Marziliano et al. This is an open access article distributed under the terms of the Creative Commons Attribution License , which permits unrestricted use, distribution, and build upon your work non-commercially.